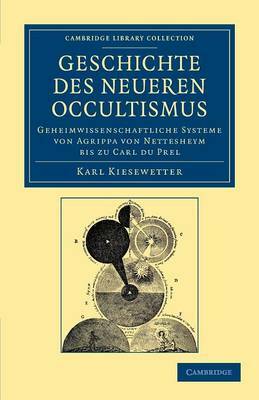 A leading German theosophical writer, Karl Kiesewetter (1854-95) produced a number of works on esotericism and occult beliefs and practices. This book, first published in 1891, remains one of the most extensive histories of modern esotericism. In his account of its development, Kiesewetter focuses on a number of historical figures who were, in his opinion, highly influential in the field. He discusses the Renaissance esotericism of Heinrich Cornelius Agrippa (1486-1535) and devotes much consideration to Paracelsus (1493-1541), whom he considers to be 'the Luther of medicine'. He also engages with the system of pneumatology developed by Emanuel Swedenborg (1688-1772) and quotes extensively from the works of Jacob Böhme (1575-1624) and other German writers on pneumatology. Also included in this historical overview of modern occultism is the work of Andrew Jackson Davis (1826-1910), who was a leading figure within nineteenth-century American spiritualism.